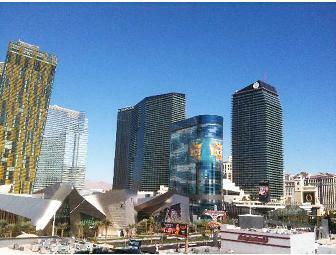 7 nights at luxury timeshare available at Polo Tower on the Las Vegas strip opposite the new City Center. The unit is a large 2 bedroom suite on the 8th floor facing the strip, so you have a great view of the amazing City Center! The 2 bedroom suites come with a fully stocked kitchen and two bathrooms. The value for teh whole week is $1600---half the usual cost. Polo Towers Las Vegas is set in the heart of the world-famous Las Vegas Strip, just minutes from Fashion Show Mall, Sands Expo Convention Center and Thomas and Mack Center. Housed in the 22-story property are 479 comfortable rooms, each featuring wireless Internet access, kitchenettes with refrigerators and microwaves, and DVD players. After a day spent taking in Sin City's famed attractions, travelers can work out at the state-of-the-art fitness center, take a refreshing dip in the rooftop pool, or grab a souvenir at the gift shop. The property also offers a children's pool and play area. Guests can direct their questions to the friendly staff at the 24 hour front desk. 930 Sq ft. 1 king bed, 1 pull-down queen bed, and 1 sofa bed. Balcony. In-room safe. Cable television service. DVD player. VCR. Phone. CD player. Clock radio. Kitchen. Kitchenette. Microwave. Refrigerator. Coffee/tea maker. Cookware, dishware, and utensils. Kitchen linens (dishtowels, sponges, etc). Complimentary toiletries. 2 bathrooms. Air conditioning. Resort offers daily towel exchange and trash pickup. Wi-Fi available for $6.95/day. " 100% of auction proceeds benefits animals in need! Your support matters, so SaveABunny would like to use your information to keep in touch about things that may matter to you. 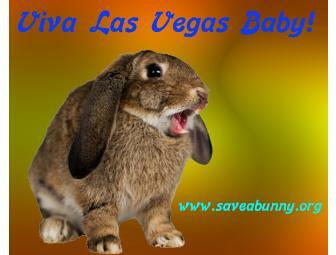 If you choose to hear from SaveABunny, we may contact you in the future about our ongoing efforts.